An ordained Baptist minister, King rose to leadership of the national Civil Rights movement beginning in 1956 during the Montgomery (Alabama) Bus Boycott. 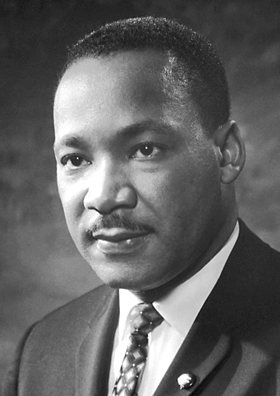 He came into national prominence as founding leader of the Southern Christian Leadership Conference (SCLC), which promoted nonviolent protest to end racial segregation and discrimination throughout the nation. His stirring “I Have a Dream” speech at the Lincoln Memorial during the massive 1963 March on Washington galvanized the nonviolent Civil Rights movement and aided passage of the epochal Civil Rights Act of 1964 and the Voting Rights Act of 1965. King was awarded the Nobel Prize for Peace in 1964, and while no Civil Rights leader was more respected or influential, King found his leadership under increasing challenge from more militant black leaders, especially after (in the mid 1960s) he merged the cause of racial equality with a general drive to end poverty—regardless of race. King fell victim to an assassin’s bullet on April 4, 1968, while in Memphis to aid striking sanitation workers.